I apologise for not putting out any blog posts last week – as usual, the magazine deadline has been a busy one, particularly as I’ve been working extra hours at my day job as well. My brain turns to mush by evening and I feel like I’d rather put out quality content over quantity. 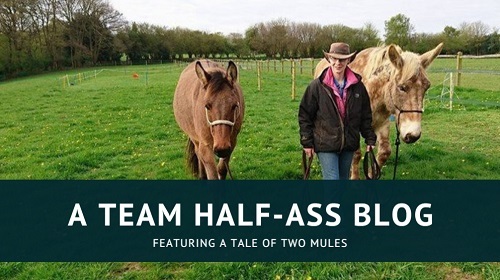 So anyway, here’s a quality post about my mule’s willy. The Saturday before last, I arrived at the yard and did my usual scan of the field to see how everyone was. 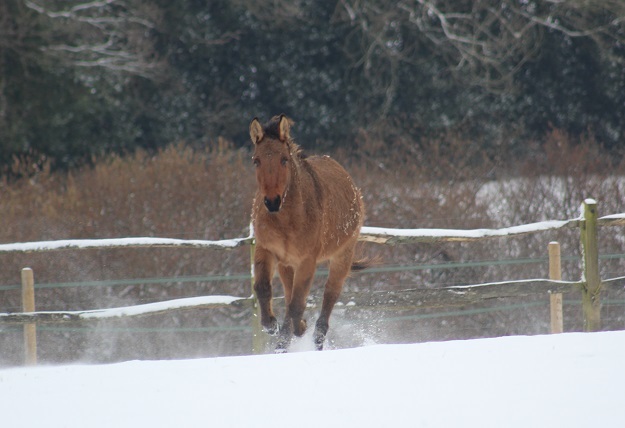 The herd were spread out – horses grazing, Xato sorting through what was left of the haynets, and Marty foraging along the hedge-line at the back. Marty noticed my arrival before anyone else and let out an immense bellow of greeting; he hasn’t really been calling to me lately, so I was surprised and pleased to hear such a clarion call. 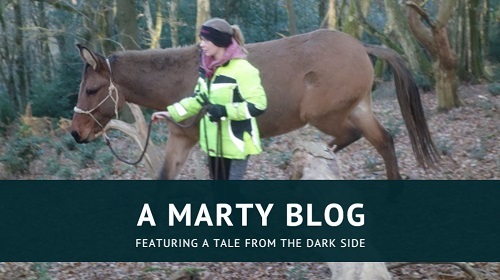 I looked away while I parked my bike, and when I looked up again Marty had made his way down to the dividing fence and I could tell immediately that something was wrong. He was standing head on, but I could see both his hind legs sticking out on either side. I waited to see how he walked off, and at first I thought he’d hurt his hip; but after a couple of strides his gait evened out, and he stopped broadside to me and ‘parked out’ like he was going to have a wee. Instead, he walked on again, stopped, parked out, and walked on. By this point he’d turned 180 degrees and he stopped and parked out again, this time for longer than before. Because of the distance and his position I couldn’t see if he was actually weeing or not. He then pinned his ears, poked his nose and shook his head in typical mule frustration, storming off and pulling ugly faces at the rest of the herd who were now gathering along the fenceline with him. Little Mare’s owner came out of the stable yard at this point and asked me what was wrong. Just as I said “There’s something not right with Marty”, he lay down. He didn’t roll, but as you can imagine my immediate thought was that he was colicing. I rang Ben and made my way up the field. Marty got up when I reached him, and was no longer parking out. He wasn’t exhibiting any other signs of colic so I let the herd through to the day field and walked down with him, stopping half-way to see what he did. He was very keen to stick with me, and when I stopped walking he carefully positioned himself so that his flank was right in front of me. I scratched his hip, working down over his belly and eventually by his sheath. He is not normally keen on that area being touched but he didn’t flinch, and I became aware that this was definitely the area that was bothering him, not his belly. The soapy hand of doom (and heck yes I was wearing my helmet for this particular interaction). I gave him a sloppy breakfast anyway to get him into his pen, and came back with some soapy water and a sponge. The problem with Marty (one of many…) is that he is very suspicious of things touching him; so although he’d been more than willing for me to put my hands on him, trying to do the same with a sponge was a different matter entirely. We worked through it and I gave him a good clean…! I couldn’t find anything obviously wrong, but then I also couldn’t find his whatsit. Where do they put it?! So I just had to do what I could and hope it was enough. He seemed much more comfortable afterwards, wasn’t parking out at all, and when I let him out his pen he ambled around easily and grazed like nothing had occurred. 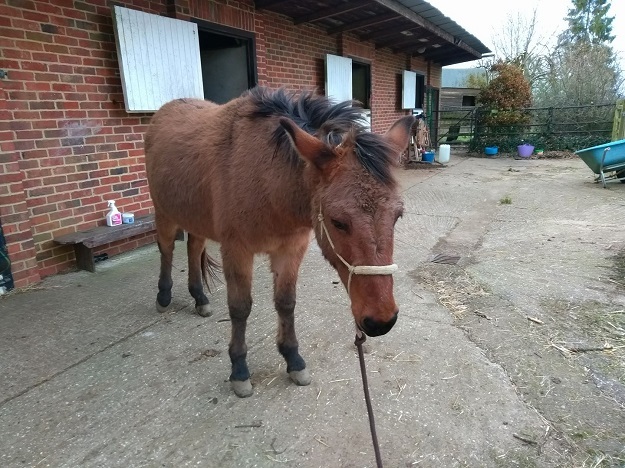 I was very pleased with him, as although he’d been in his pen he had been loose throughout; I think if I’d tried to halter and hold him it would not have gone so smoothly. 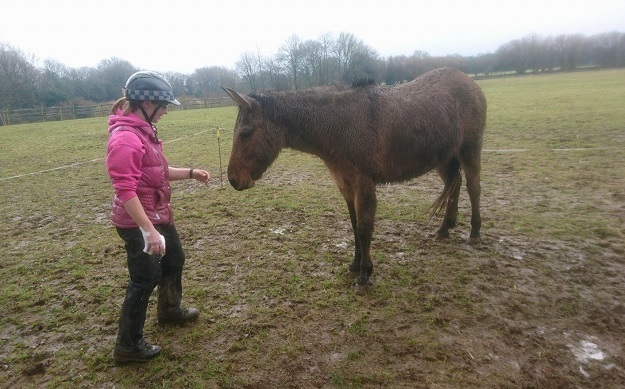 From what I’ve heard, this seems to be a mule preference – they like to be given the freedom to go if they need to! Unfortunately, a couple of days later we noticed him parking out again so this time we called the vet. She listened to his heart and his gut, pronounced him hale and hearty, and agreed that he probably had a smegma bean stuck up his old John Thomas. I had foolishly assumed this would be an easy process, but oddly enough Marty did not take kindly to a stranger with a headtorch peering intently at his nether regions, despite a triple dose of sedation (the way it’s done is they sedate them with the regular stuff, of which Marty needed the maximum amount, and give them a bit of ACP as well to make it all hang out). 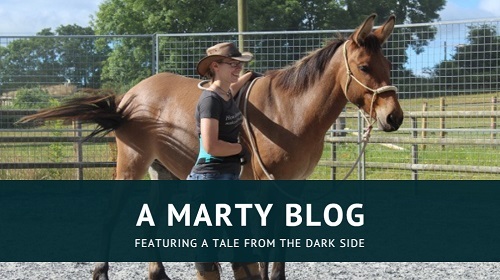 In the end it took the sedation, a twitch, me covering Marty’s eye and Ben holding up a foreleg, and even then he was still able to kick out. This was after the first dose of sedation. He was very sleepy until he wasn’t. I am not a fan of twitches and would not use them in any other situation than a medical one. Sometimes, you just need to get it done. He couldn’t safely be given more sedation and there was no point doing a half-job, as we needed to know if it was just the bean causing him discomfort or if there was something else going on. Given how easily offended Marty is (remember that time our trimmer accidentally plucked out one of his belly hairs out? He still hasn’t forgiven her, nearly a year later) he doesn’t mind the twitch at all. The first time I had to use it was when we were trying to get an ultrasound of his neck, to check that the bone spur picked up earlier by x-rays wasn’t touching his nuchal ligament; I thought he would never let me near him after that, but it was a complete non-event for him. I’m making it sound like he was a total hellion, but he was actually being really, really good. He was trying his hardest and was only kicking out when the vet stuck her hand up his sheath and took hold of his todger – and honestly, wouldn’t you? Anyway, since that day, he has been an incredibly cheerful, friendly mule. In fact he’s been so easy-going we’re starting to wonder if this willy business has been brewing for a while. I don’t for a moment think that it’s the reason for all his problems, but it probably wasn’t helping! I’m really very pleased with Marty after all this. I don’t think I would have been able to check on him in the field like that a couple of years ago, and I don’t know if he would have “told” me as much as he did either. I think the reason he made such a fuss when I arrived that day was because he knew that I was someone who could help him; he’s a funny little fellow, and I’m glad that I can be that person for him. Not having a sore willy probably helps you enjoy life a whole lot more.